As hard as it is for Mommy (and I) to believe, I was considered 'less-adoptable' because of my age, the fact that I've only ever been an only cat and that I was declawed by my previous owner! I was underweight, grumpy and had a very bad shave job, but Mommy knew when she saw my cute face, that I was destined to become a Monkey. She adopted me from Gerdy's Adoptions and Rescues. Gerdy is a wonderful woman who takes on many 'less-adoptable' dogs and cats and makes it her mission to find them a loving forever home. Because she saved me, I want to feature one of the other cats at Gerdy's who needs a forever home pronto! 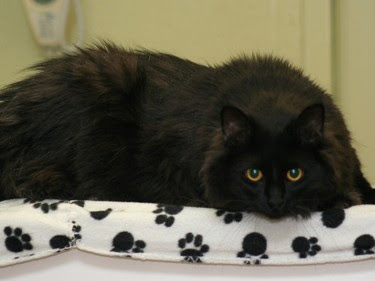 This big impressive black Domestic Longhair is an IMPRESSIVE cat, a Gentle Giant who wants only to be given a spot in the sun and loved! Neutered, FIV/FELV tested negative, vaccinated, dewormed, Gucci has his own Gucci bag packed and ready to move in with you! Dramatic in appearance and about 2 years old, Gucci gets along with other cats and likely could hold his own with a friendly dog! A friendly male, he is no cheap imitation, OUR Gucci is the Real Thing—a great cat! I can't understand how someone would abandon this handsome Mancat! We are purring that Gucci, and all the other kitties and doggies at Gerdy's Rescue, get adopted soon. Also, our good friend Tasha made us aware of another bunch of cute kitties that need help finding homes. That is a good looking mancat! Bella, you were meant to be a Monkey! We're so glad your mommy found you! It's so sad that someone abandoned handsome Gucci. We will never understand how that can happen but we are purring very hard that he finds the furever home he deserves! We wish we could take in all the kitties needing homes but since we can't, we're purring for them all! I also don't understand how someone could leave Gucci behind. I hope that he finds a real forever home soon. We have to agree with BeadedTail...you were meant to be a Monkey! We feel so sad for 'less adoptable' kitties and we hope many of them find homes this week! This is a really beautiful post. We can't believe that yoo could ever have been considered 'less-adoptable' ~ it just shows how silly people can be. And Gucci too ~ he is handsome and gorjuss and lovely. Gerdy is obviously a wonderful woman and we are proud of her for having such a fine and caring soul. We larfed at the: "Mommy knew when she saw my cute face, that I was destined to become a Monkey" ~ and it made us think yoo shud start an exclusive "Monkey Club" ~ the criteria for joining shud be that yoo hafta be cute! If yoo start one, please can we be the ferst members, afta yerself of course? Awww beautiful bella Bella!!! Me and Charlie are so sad to hear that you are de-clawed - poor sweetie!! But we are so so so so happy that you are now a Monkey!! Well done mum for seeing how sweet and adorable you are!! We hope all the kitties featured in your links find happy homes. P.s. a big hello too to adorable Samson and Delilah! You all are gorgeous and how it can be 'less-adoptable' Don't let those words upset you. Bella, we are so happy you have become A Monkey! And Gucci's story started out awful! really??? FORGOT to tka ehim along??? Come on! He is uttely gorgeous and we purray furry hard he finds his furever home ASAP! Hi Bella! Did you know I was considered less adoptable too?? It's because I'm black. Hard to believe, right? You are gorgeous now, and I'm glad your mom gotted you!! Gucci is very handsome and we hope he finds his furever home soon!! Bella, we know you are too cute. Gucci really is so handsome. It is unbelievable that he was left behind. I wish I could take them all in. Thanks for telling us about Gucci. Have a great day all you Monkeys. We're not happy that Gucci was left behind - that is awful! But we are very glad he found his way to Gerdy's - we think she is a great person - and we're purring for him to find a wonderful forever home. And we're also very glad that your mom adopted you, Bella - we think you are both lucky! P.S. 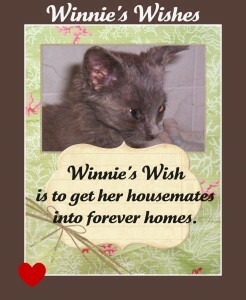 Thanks so much for posting about Winnie's Wish! Lots of purrs and Light to him, that he finds a wonderful forever home very soon! Bella, we can't imagine you were less-adoptable either! We're glad your mom had the good sense to see your potential! We hope that Gucci finds his perfect forever home soon. Bella, it is just hard to believe...look at you, you are purrfect!!! Great post! I am co-hosting a blog hop today, please hop by and pawticipate! Bella, we are so happy you became one of the Monkeys....you are such a sweetie pie. Gucci looks just like Sammy!!!!!!!! We are purring he will find a wonderfully loving home that will be a forever home. OMC! Gucci just made mom gasp and get all woozy! Mom says he is like Nigel, a big young handsome black silky furred love machine. Nigel was abandoned too. How can people do that? Hopefully Gucci will find the purrfect people, just like you did Bella and just like our Nigel did with us. Spread the word about these wonderful babies! Bella, we are so glad your were saved and adopted into such a wonderful family!! Wow, Gucci is gorgeous! Reminds us a lot of our Saylor! Sure hope he gets a second chance at a great life! Gucci is pawsome! We are sure he will find a forever home soon. We think that with the economy being bad, more and more people are abandoning their pets. What we don't understand is why they don't take them to the animal shelter? Why do they just leave them behind? Duh. Wow Gucci is one gorgeous hunk of mancat. We hopes he finds a home soon. We are so sorry he got "left". Oh Bella!!!! You are SO cute no matter your age!! Hard to think you were "not adoptable" !!! Same with Gucci!! He is a pawsome looking guy and only 2??? We hope he finds the home he deserves! Bella we are so glad that you're a Monkey now. 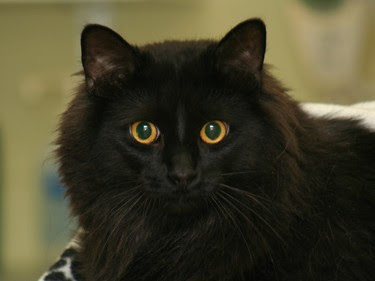 And we hope Gucci will find his purrfect match furry soon, what a handsome boy he is.Tall, dark and handsome! It's hard to believe anyone would leave an animal to survive on its own. It makes me so sad, but thankful for wonderful people like you guys who find them and rescue them. What a handsome mancat! It just makes me so sad to hear about all of these kitties being abandoned. I'm so glad that your mom adopted you and that you are an official Monkey! Yes, I hope Gucci finds a new and loving furever home very soon. It always makes my heart ache, but there are so many out there, and we can't take them all. Bella seems very well adjusted now, and I just love her darling little face -- and the awesome looks that she gives. How ever could somebody as cute as you be considered less adoptable? You are so cute. Gucci is gorgeous. Mum wishes we lived closer. She likes big boys. Just as well really. Bella, we are so happy you are a Monkey now. And what a sad story that someone left Gucci like that. He is so handsome, and we are purring and praying that he finds a forever home very soon. My mom made a special page call " We Support Rescued Breed " She link your page to these, we hope you don't mind. We are finally catching up with visiting and so this is a tardy comment...but with your sweet monkey face, even a bad haircut couldn't hide your cuteness! And mancatalive, that Gucci is stunning...we hopes he finds someone who loves him furrever soon!